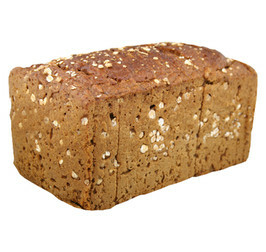 Home ➜ Assortiment ➜ Bread ➜ Danish rye bread. Thaw bread in its bag for approx 6 hours. Preheat the oven to 18,0°C and bake for approx 15- 18 minutes. Water, RYE sourdough, RYE sifted flour, RYE kernels (12%), whole grain flour of RYE, malt extract of BARLEY, RYE fiber, salt (iodine), RYE flakes, yeast. Decoration: RYE flakes. May contain traces of sunflowerseeds, soya and milk.